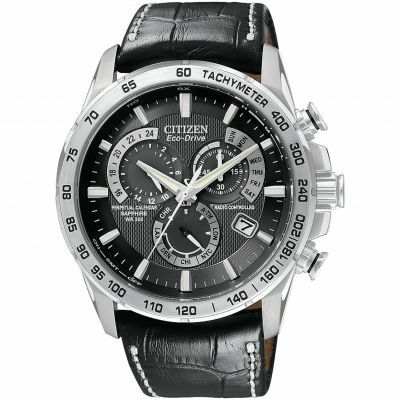 A Chunky mens Citizen Chrono Perpetual A-T model in black Ion-plated steel with silver touches on the dial. This fantastic and intelligent mens watch features date and month functions, chronograph, tachymeter, radio control, 200 metres water resistancy and alarm function. 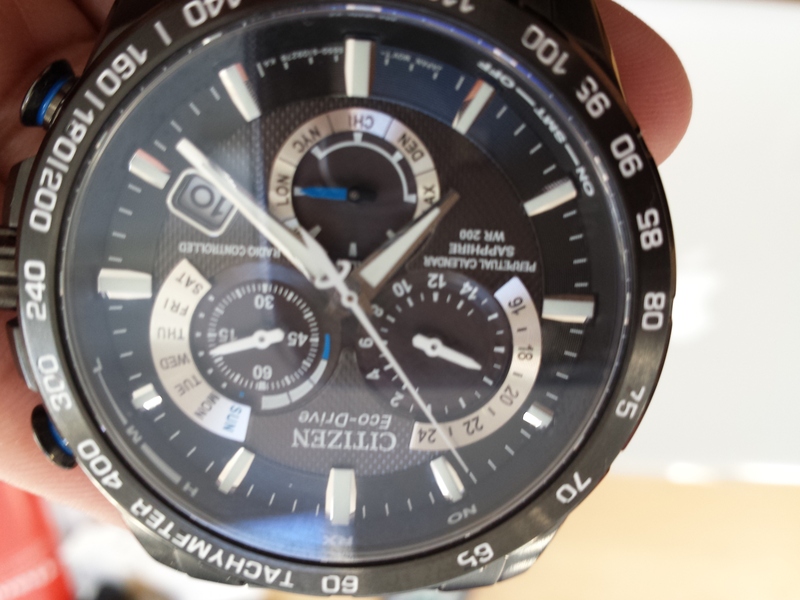 The watch is powered with the Citizen eco-drive movement. 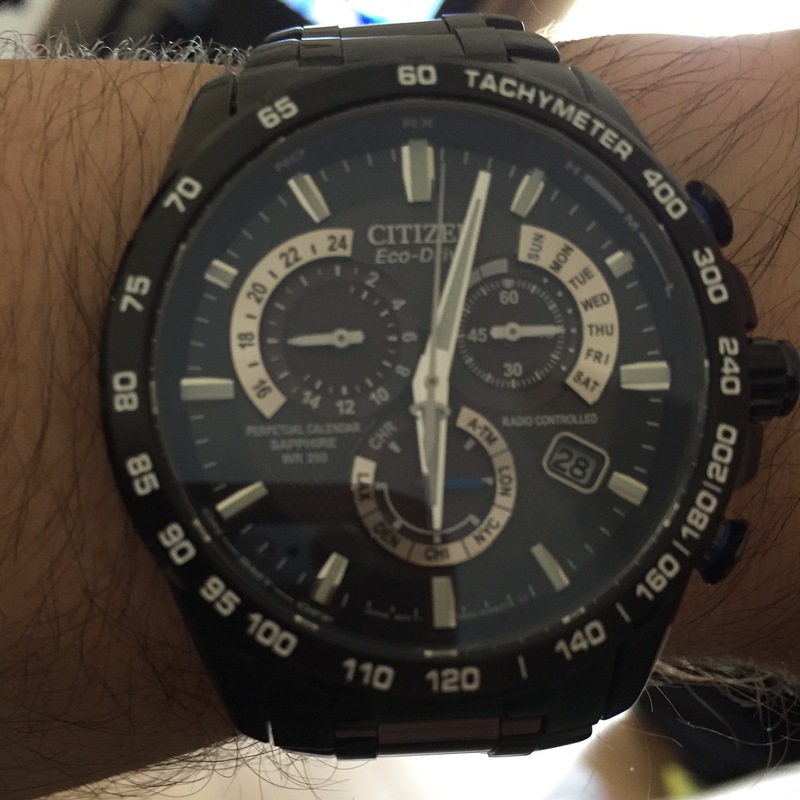 Im delighted with my new Citizen AT4007-54E! It worked straight out of the box was already partially charged. It looks very smart on my wrist and it is very comfortable. I havent worn a watch for several years, have been using mobile phone, but i got used to the feel of the watch on my wrist very quickly. I picked it up from Goldsmiths in Bluewater, and they adjusted the size for me. The strap size can be adjusted by removing full or half-size links, for me removing 1.5 links gave the perfect size. I really like the eco-drive light powered watch, i find that charging in the winter sunshine on the window sill for 20-30 mins boosted the power reserve to almost full. this is way quicker than when i used a lamp. It is receiving the radio signal no problem while on my bedside table at night , and the time is perfectly set. TBH the chronograph isnt something i really need, and cant see it clearly without my reading glasses! I am slightly disappointed that on this model the radio timekeeping isnt used if i travel to Europe and i set the time to ATM if i have read the manual correctly. There are only 5 cities listed on the watch, so everywhere else you have to choose ATM, which is ok, but you would think that as it receives the radio signal from Germany, then it could cope with me setting +1 or +2 hours and stay in sync with the radio signal while Im travelling in Europe. I guess it will be accurate anyway without the radio signal, but its just a small niggle. Still love the watch, and would recommend to anyone. Watch was a 60th birthday gift from my wife, chosen mainly by me - but she likes it too. Excellent product. Bought it to replace an older Citizen watch that I have had for years and the quality of the replacement for it does not disappoint. Looks fantastic and feels quality as soon as in hand . Colour different from all my other watches . 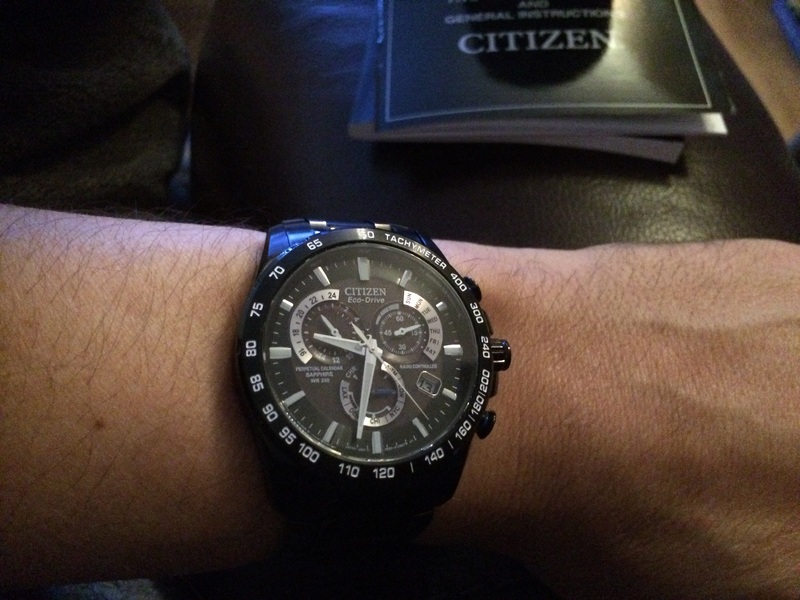 Love the Eco Drive of Citizen watched . Already looking which one I will get next . Great watch does exactly what it says on the can. Very smart looks good yet robust enough to for the active man. Bought as a special gift. Lovely looking watch. Bracelet is eyecatching. Well worth the price. Excellent watch, classy and good looking , also practical and stylish with a hint of 007 class. Absolutely stunning watch and looks even better in person, perfect mix of stylish and sport that will suit any occasion. Very comfortable and I barely notice that Im wearing it sometimes. My previous watch was a G-Shock Giez line which was also a very attractive watch. In terms of weight, it is very light considering it is made of titanium and feels extremely sturdy and Im comforted knowing that this is sapphire glass one of the toughest materials on watches and scratch resistant, an upgrade from my mineral glass G-Shock. However I am unsure as to how much beating this watch can take, I could regularly throw my G-Shock around and know that it was going to be okay but the sturdy feel of this watch puts me at ease, I wouldnt test it though but Im sure a few bumps here and there would be fine. The watch did need recharging for a few hours before use by exposing it to sunlight, the setting up was a bit fiddly at first if you have the instructions youll be fine and if you have a chronograph you may already have a basic understanding how they work. Annoyingly, the buttons on the watch dont start and stop the chronograph- unlike other watches, instead you have to pull the crown out to select the chronograph mode, wait for all the hands to turn before using it about 5 seconds, which isnt a major inconvenience but questionable when the buttons only serve to check the battery life and daylight savings activation in normal operation. You can only time for a maximum of 60 minutes on this watch and must stay on the chronograph mode for it to continue timing. Personally it doesnt bother me too much because I use my phone for timing anyway. There are 5 time zones programmed into this watch, USA time zones and London. Im from the UK so I receive radio signals from the tower in Germany which work well provided the 6 oclock is pointed towards a window and left untouched. For other European countries, the alternate time mode will help as they will still be able to receive radio transmissions from Germany check the radius on Citizen website but they can change the hour and minutes so the seconds are in sync with UTC. Another thing to mention is that I wear the watch on my left wrist, having never had a watch that had a crown I find it quite awkward to pull it out as my left hand gets in the way, Im sure those who have these type of watches have mastered the technique but I find there is a nice groove on the crown that I can get my nail into. Overall a stunning watch and definitely worth the money, would recommend to anybody thinking of getting it. Paying more for a product that you know you can trust and will perform is important and no doubt will last you longer. Love it, looks amazing and what a fantastic price from the Watchshop, delivery was quick and Goldsmiths changed the strap size for free when told them it was from Watchshop would defineltly order from Watchshop again very pleased with purchase !!! Delivered on time. Watch looks great. Very good service. I bought this for my hubby for Christmas, so cant really comment on how it works etc. But it is a great looking watch, my son has the same watch but in the silver colour and he had watch envy when he saw this one. He loves his own watch and assured me I had made a very good choice. Im very happy with my new watch thank you , I like the blue bits in the watches thank you again . Watch is a Christmas present so not able to comment on use. The watch arrived on time and the packaging was good protecting the watch. The service provided was excellent. 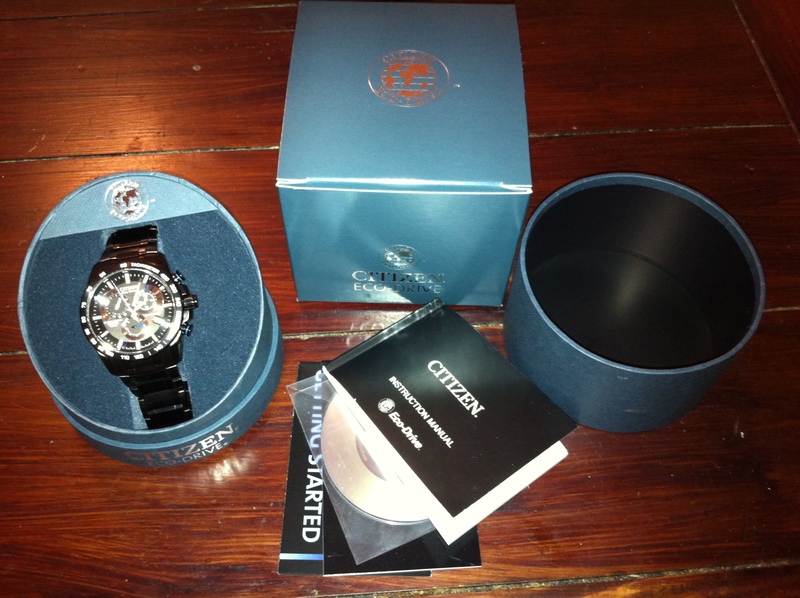 excellent citizen watch, excellent service,excellent company thank you very much. What a fantastic watch I have purchase and I should have bought one of these a long time ago. The watch is excellent, the only way that it could have been any better would have been if it had been made from titanium love titanium watches!. Instructions are very clear and easy to follow. Watch is comfortable to wear and the dial is clear. The case and strap are beautiful to the eye. Throw in the radio control nature of the timepiece, the perpetual calendar, the eco-drive and the remarkable toughness of the watch 20 ATM, ion coated case / strap and I think you possibly have one of the worlds best watches. Practical for pretty much any occasion. 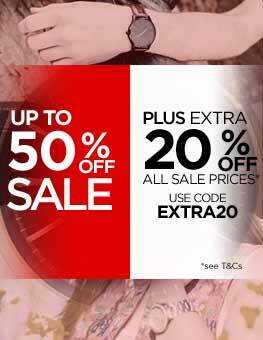 Watch Shop are great, prices are great and I thoroughly recommend trawling the web for discount vouchers I got an additional 8% off an already heavily discounted price on this. Bought as a gift. Absolutely excellent watch - very pleased. Loads of useful features. Came at the size I requested which then involved me contacting customer service to correct MY mistake! - brilliant - very, very helpful and very happy customer - THANK YOU. Would definitely recommend. An excellent product, i am a watch and time freak. 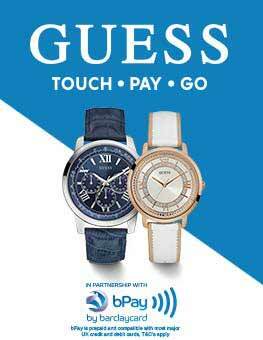 The watch has to look good and show the precise time which, being time signaled controlled it does. At first i was unsure of the black bracelet but now find it eye catching. An amazing watch, coupled with amazing service. The watch in black gives it that classy edge. Features on the watch are second to none. It has the perpetual calendar and Eco systems are outstanding. The sapphire glass is a really nice touch on this reasonably priced timepiece. The one criticism is that the QR code in the box, no longer seems to work, so YouTube once again comes to the rescue. This is a great watch. It looks good, the black ionised steel is very different. Its light and comfortable but has a lot of technology under the hood. Its solar powered so no battery. Set by atomic clock so always accurate and sapphire face which greatly decreased chances of any scratches. There is only one down side which is the bezel, it doesnt spin which somewhat cheapens the design but Im comparing to watches that cost thousands. 5 year guarantee shows citizens confidence that it will last. A great watch with great features at a reasonable price. 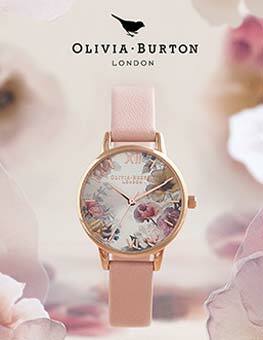 Love this watch, may look at purchasing another colour in the same model! Great watch . Great service . Watch arrived within 24 hours of ordering! Lovely watch, reassuringly weighty on the wrist. Used the Goldsmiths option to have a link removed. The multi city time zone will be really useful as were off on holiday to Canada and will be staying in at least two different time zones. The only downside was that the Eco-Drive watch arrived completely flat and it took several hours under a table lamp for it to spring into life. I bought this watch as a gift for my husband. The service was quick and reliable. The watch is as it looks in the pictures and works well. When first starting up the watch it has to charge which is something good that I was not used to as normally I buy a standard watch. Great looking watch, easy to set when charged, illuminates brilliantly in the dark and very happy with the purchase. First of all i would like to thank you watch shop for amazing service quick delivery. 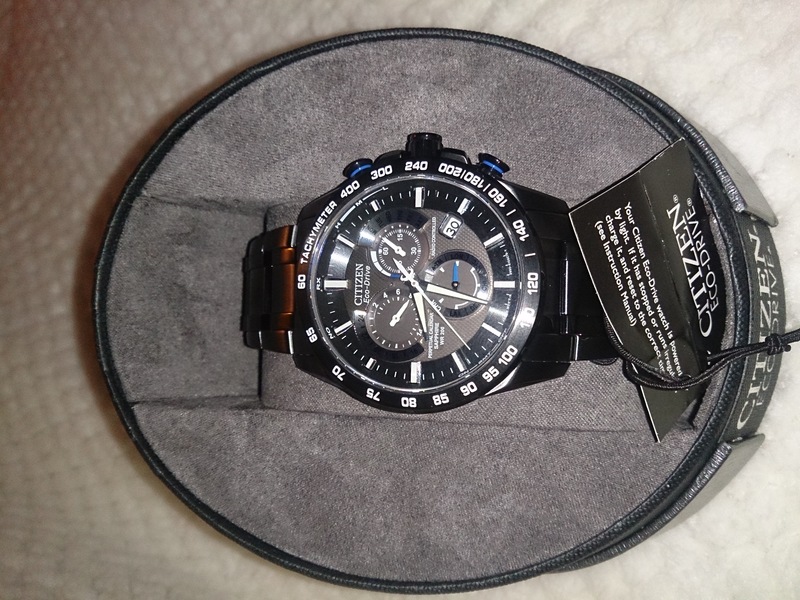 This is my first watch i owned in my life best watch ever made by citizen after looking all the review decided to get this watch on first day i got so many compliment cant stop looking at the watch .i would recommend 100%. 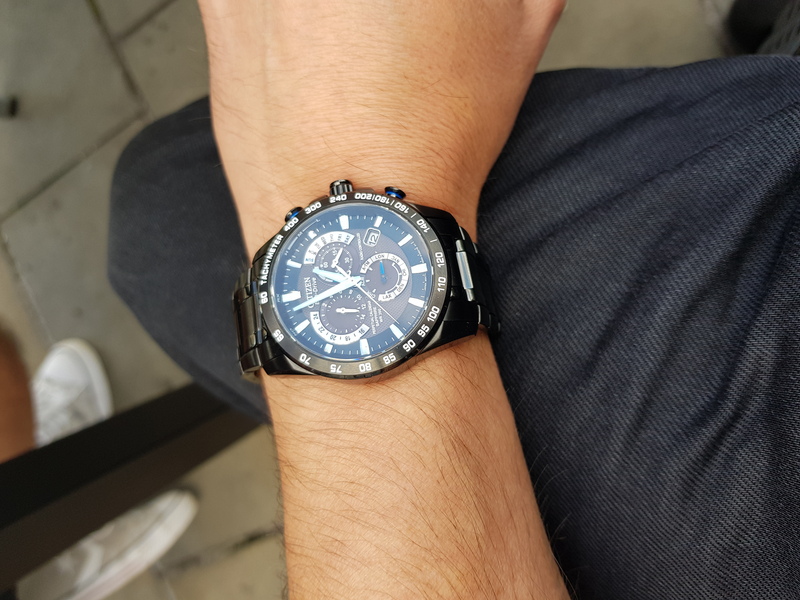 Nice watch, looks great, good weight about it, not too big but I do have quite big wrists !, takes a bit of charging first off if its not that sunny but up to press seems fine, it set itself as stated and we have had BST change which it also did. Does exactly what it says on the tin!! Great service, excellent product and fantastic price! Great looking watch. Seems very robust and weight is perfect. Left it to charge in sunlight for two days, it set the time and date itself and was ready to wear. Updates every night without fail. A brilliant watch!! Spent a few months trying to decide, wish Id made the purchase sooner. Love my watch. Been after it for 6 months and finally took the plunge, so glad I did. after much deliberating about the purchase of a new watch I opted to go for this model. whilst other options for this model are available the uniqueness of the colour scheme appealed most. the watch itself has a number of brilliant features, automatic time zone adjustment, automatic date adjustment for the shorter months so I dont need to worry about doing it....plus the added factor a battery isnt required. once out of the box all I had to do was leave on the windowsill for a couple of hours in order for it to charge itself up and away I went. We chose this watch for our sons 21st birthday. It is excellent quality, as you would expect from Citizen. We felt the black design was a more modern style for a fashion conscious 21 year old. He was so pleased with our choice! We have ordered from Watch Shop before and will do again in the future. This watch I would highly recommend as it is a really well built watch and it looks far more expensive than what it is. Love the dials at night when they light up in the dark. 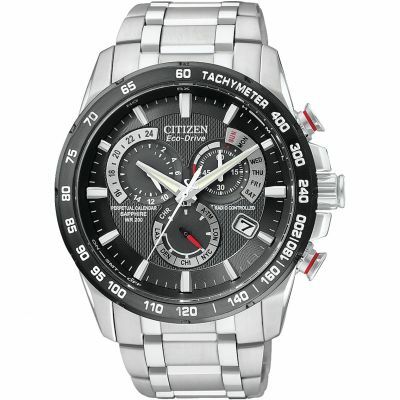 Would recommend this watch or the Citizen Eco Drive watches for sure. The watch is great, however far from what it looks in the picture. It is actually balck as shown in the other photos and not grey. Otherwise the product looks and works great. Bought is as a gift for my husband and he is very pleased. The watch was as described and I am more than satisfied, both with the product and delivery which was next day as promised. Website very easy to use and gave excelent description and photo of watch purchased. Would shop again at Watch Shop. This is a quality product that looks better in reality than in the pictures, it has several different functions which are easy to read while being both practical and stylish they are easy to master and understand by using the excellent instruction manual and also a video on the citizen website, an additional bonus is the battery never needs to be replaced. It has a five year guarantee which is extended to six when you register the watch with Citizen. The watch also comes in several finishes which should appeal to a wide variety of customers. Really impressed with this watch. Thanks to the radio sync signal it is always on the right time. The date manages to keep track of leap years so no need to spool the date forward at the end of Feb! Add to that the Eco Drive charging means you will never need a new battery. Also I have quite thick wrists and this fit straight from the box with no adjustments needed. This is without doubt one of the best and most attractive watches I own. Radio controlled accuracy. Beautifully designed and very comfortable to wear and certainly looks and feels like a quality timepiece. Like other reviewers, I too cannot stop looking at it when wearing it, which makes it a bloody nightmare when Im driving! Anyone in doubt about buying this....dont be......Its truly fantastic. Great watch at a great price, fantastic service and speedy delivery from the watch shop. Good quality and functions. Reassuring to know that the time is 100% accurate due to the automatic daily updates. Have had nearly a year and no issues. Would recommend. This is a great watch. It is packed full of features and seems to have loads of power even on these darker winter days. It looks fantastic in the black bracelet and face and I really like the multi time zome feature. Im still getting to grips with the many features but overall this is a great watch. I got this as a christmas present for my husband. He hasnt seen it yet so cant comment on the fit etc. Its a lovely watch. Theres lots of detail on the watch face and it looks like its made really well. Very smart Im sure he will love it. I like the black finish of the bracelet strap it makes a nice change from the silver look ones he would usually go for. Very happy with the watch. Read reviews prior to ordering and more than meets my expectations. Ive been after a non battery Eco watch for ages and have tried several during my search. The design of the watch is good with all the dials being easy to see and he radio control ensuring accurate time Id kept the all black finish adds to this. Even though its got a metal strap its not overly chunky it heavy used to wearing a titanium diving watch which was good. The only slight negative is the alarm. Getting to that function is pretty instinctive, but having to wind the hands round to the alarm time is frustrating. Overall Im really pleased with this watch. An excellent item, I would recommend it to family and friend. Time is accurate. It is a beautiful modern timepiece. There is nothing that I do not like about this timepiece and I hope that it will look as good for years to come. 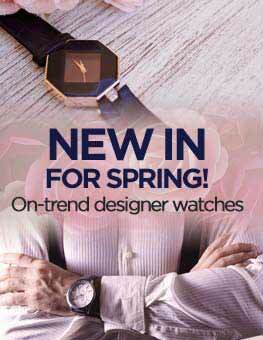 It is lovely watch that can be worn on special occasions as well as for daily wear. I bought this to use as a work watch. It is very accurate, and is a good solid timepiece. The colour is good and deep, the face full of information, whilst not being too cluttered. The watch is somewhat heavier than I have been use to, but not outlandishly so. The general appearance is understated, and as I work in artificial light almost all the time, it is very easy to read at a glance. All in all a very good watch and great value for money. excellent service, arrived next day, and product is first rate. The watch is exactly what I required. The watch was received in quick time and excellent condition. Looks great and is exactly what I was hoping it to be. Just bought this watch after weeks of looking at it and other watches on this site and couldnt decide what to get, I have definitely made the right choice. It arrived in two days ordered at 8pm Monday and arrived 1 pm Wednesday!! The watch is very comfortable to wear and isnt too bulky but does stand out compared to other watches due to its unique colour, it may looks black in some images but it is not. Most expensive watch Ive bought and it was worth every penny!! If you are looking at this watch and thinking of getting it, just do it today and enjoy it! Beautiful watch, lovely weight, no complaints. I wanted a watch that I didnt have to worry about changing a battery in, so a Citizen Eco-Drive made perfect sense. I liked the satin black finish and the white and blue detailing really help make the watch stand out. Although it it quite a large watch it isnt too heavy and doesnt feel bulky while your wearing it. Another great feature is the radio controlled feature which updates the time every night, making sure it keeps perfect time. Very pleased with it. This watch looks great on the hand, and can be combined with many types of dresswear. But what is its main selling point, is the fact that ayou never have to worry about changing the battery and byou never have to worry about adjusting the time. Also, it has a sapphire scratch-proof case, and is water resistant to 200 meters. For the practical man, who does not want to compromise appearance either, this is a great watch. Excellent service. Watch packed very well, so the box was totally undamaged - important as this was a gift. Am about to get the strap altered locally and will then submit receipt to Watch Shop for reimbursement - I think this is a great feature of the service. All in all, very happy. very stylish, clear display. I love the fact it came already setup but anyone can do it as theyve made it so simple. I was surprised to find that it has a luminous display, which is an added benefit. The colour, style and specifications are just what I have been looking for and it will be a treasured 50th birthday present. This watch looks and feel awesome. The finish is superb and when the light catches it the face really pops. The bracelet is comfortable and the catch seems to be very sturdy. Just got it. Placed order on Friday night and at 8 am on Monday postman delivered it. It so nice, not too light but not too heavy. If you dont like shiny watches then this one if for you, made from black /smoked steel, with brushed finish. Face got everything what this wath should have it. Its marked as water resistant up 200m and its covred with sappphire glass, wich is really important if you use it everyday.Got few gadgets like radio controled zones and its eco drive so it meansthat its converting light into power and stored enough for 6 months. 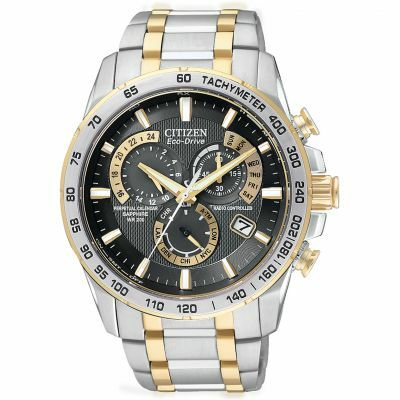 Really best choice from citizen with metal bracelet.Plus WatchShop offering Pay4Later that means you can afford more expensive watches by monthly payments. Recommed this watch and also this website. Great looking watch, stylish, eye catching, a little heavier than my last watch but not noticeable after a while. Some of the text is small so if you wear reading glasses you will need them to read everything on the dial. The radio feature is cool, but in my house it will only sync in the window or upstairs and have to face the 6 oclock towards south east. Not a problem once you are aware, it syncs at 2am so its just something to think about when you take it off at night. And if you have grown up children boys, keep it away from them otherwise you might lose it. delighted with my watch. delivered within 24hrs. Citezen watch fantastic, thank you. Most expensive watch ever for me by a mile. A young mans dream finally achieved after 60 odd years. The face is a real pleasure to look at.The bracelet has smooth feel and fits beautifully. Very Good service and excellent product. Well pleased. Thank you very much. I am delighted with it. Bought this watch for my farthers birthday and he was extremely happy with a look and the features. It took about half an hour on a sunny day to charge battery in full. I believe it fits casual and formal clothes. Its black and shiny. I love it! What a great quality watch. The second hand actually points directly to the second markers - something that my previous Tag Heuer even failed to do. Looks fantastic - the colour is more gun-metal than black - which in my opinion looks far more contemporary. My first expirence with black watch and with citizen.Nice and beautiful watch.in other words I LIKE IT. The watch has very good build quality. The watch is quite light and is very easy to use. The fact that the watch is raido controlled and has eco-drive means that you only need to get it sized and it does the rest. The other features of the watch are straight forward. The watch face is easy to read as theres not too much going on. this is a stunning timepiece beautifully crafted and very very aesthetically pleasing The colour is more graphite grey than black which just enhances its good looks Like most mobile phones this watch comes with a host of features that the normal person will not use If i have a bad point about this watch is that i thought it would have been slightly chunkier in size but i really am splitting hairs here It is a big watch with a bit of weight on it so you know you are wearing it Really happy with my purchase!! 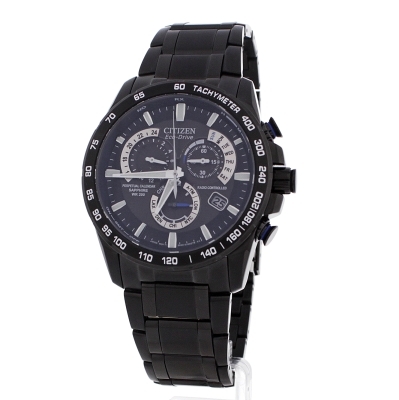 The Mens Citizen Chrono Perpetual A-T Alarm Chronograph Radio Controlled Eco-Drive Watch is absolutely stunning! I received it a couple of weeks ago as a gift for my 18th Birthday and I still cant enjoy it enough. I dont normally write reviews, but when I like something a lot, I just cant afford not to share it with those who are hesitant whether to buy it or not. One of the best features of the watch is the Eco-Drive technology. The fact that its powered by light means youll never have to worry about its life, as it will be working indefinitely. I also love the auto-adjust feature, so to speak, which lets the watch set the time, date and day to the correct format with a single push of a button. In other words, youll never have to remember which day of the week or date it is. If you accidentally changed the time, by pushing a single button, the watch would reverse back to the correct time, date and day instantly. In terms of its looks, it looks gorgeous so stylish and elegant. It looks much better in real than it does on pictures and photos. Many friends of mine have already complimented me on my new watch and they all like it. Im not an avid fan of watches, so I cant really comment on its negative sides as I cant find any. I simply love the watch and wear it all the time. I would highly recommend the watch to anyone who likes Citizen and want a stylish, fashionable mens watch. For its price, its probably one of the best looking and highest quality wristwatches on the market, no wonder its a bestseller. If you can afford it, you will absolutely love it and wont take it off your wrist. I was looking for a new watch that was unique and wasn’t overly expensive but looked like it should cost a lot more than it did. Also one that I intend to keep for a long time. This Citizen watch ticked all of those boxes. I prefer to go for watches made by actual watch companies rather than designers who jump on the watch making bandwagon. You can tell the difference in the design and workmanship, it’s not too shiny or flashy, does exactly what it needs to and nothing more. Citizen are a good example of this. I bought it for myself after buying my girlfriend an engagement ring! I consider this my engagement watch! Now we both sit there staring at our hands/wrists but for completely different reasons! Basically a brilliant watch by a high quality watch maker. Highly recommended! Nice looking watch, good weight, came already set up but had good instructions. Best watch Ive had. Long waited review.. Ive been waiting to write this since i got the watch, but thought i will try to experience it for a couple of weeks so that i can have a better view about the watch. First of all, the watch is stunningly built and designed, as most of the reviewer says the picture in the website just dont do the justice. very beautiful piece of watch on your wrist. IF you like a simple watch, may be this watch is not really for because you need to remember a few different set to do different things, even though the manual is pretty good but for stuff that you might need to do not so often you might need to come back to the manual every single time. what im trying to say is if you just need simple watch maybe there are other model that is better for you. For you who need the watch sometimes in the dark, you probably a bit disappointed with this watch because it has now light apart from the glow in the dark pointers so you wont be able to see other things like dates and day, but most of us use mobile phone for this so i think its not a big issue. One other little thing that makes me really disappointed with the watch hence i only put the rating as average is the quality of the paintings on the numbers surrounding the watch you can see the picture attached that is really poor for a watch price nearly £400. In a way its great that i tried this for few weeks so that i can found about this issue as im really surprise two weeks in use some of the paintings on the numbers and Tachymeter word have been wore off, its like ive been using it or years. please keep in mind that i work in an office and most days wearing long sleeves and during these past few weeks i didnt have any incident where i bump my left hand to anything which might cause the paintings wore off. Its just really disappointing spending money this much to get a quality product but because of poor quality on this end made my purchase a little bit not worth the money as i have a US$35 Timex that ive been using for nearly 6 years but still have good conditions on the paintings. Without this issue i will give 5 star ratings, but because its quite obvious then unfortunately i need to penalise the ratings, this wont happen if the watch not as expensive as this. hope this help giving you an overview of the watch and help inform you before making the purchase. Great product, couldnt be happier but more than that the exceptional customer service and communication as i needed the bracelet adjusted was a credit to the Watch Shop. 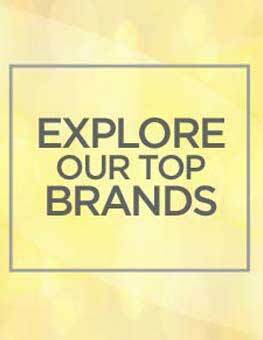 I would not hesitate to recommend the Watch Shop to family and friends, possible one of the best internet retailers I have ever dealt with. The watch is just what i wanted just cant keep looking at it. Also travel quite a lot so great for keeping time difference. Has so many features have to carry manual with me for couple of days just to get the hang of it. All in all would reccomend watch and company as have had no problems also 5 yr guarantee. I have had my new watch for just over a week now and I am very pleased with it, all the features work as you would expect them to and the instructions are very easy to understand, and on top of all that it looks absolutely gorgeous. Excellent service from the watch shop as well, ordered it on Monday and it was delivered free on the Tuesday, I would definitely use this site again. Thank you very much. I saw this watch on the website months ago and immediately loved it. When I eventually bought it i was not disappointed. The watch is brilliant, excellent quality and whats more i do not need to change the time, date or battery! 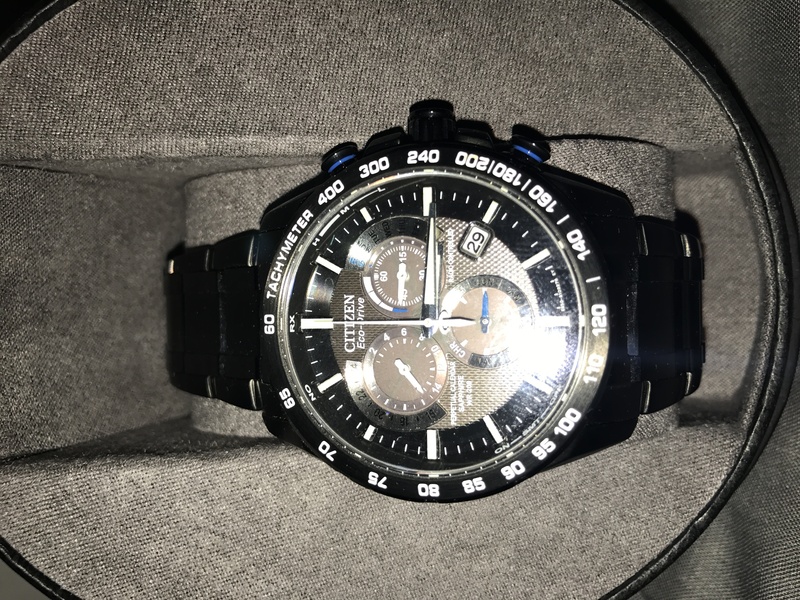 Ive been looking for the right watch for a good while and finally decided on this Citizen watch and from all the pictures Ive seen on the internet, none of the pics have done this watch any justice. The watch is a stunning charcoal gunmetal colour, where as indoors its a dark grey, but in the daylight.... Wow !!.... Its simply stunning !! First of all this is 100% as shown on the website and awesome delivery service by Watchshop, right on time without any trouble. They also deliver at your workplace or wherever you want. So no need to take a day for collecting your special delivery mail. Thank you Watchshop team!!! 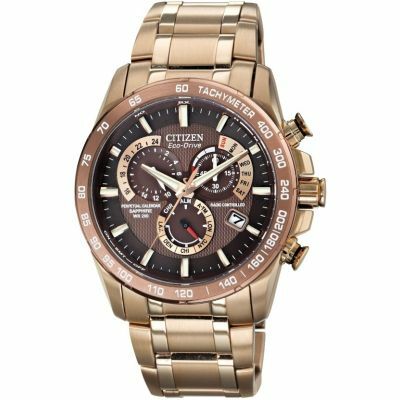 Citizen Chrono Perpetual is one the best buy for people who love their watch to be elegant, standout and professional. Amazingly no worry about dying battery as it is powered by sunlight to be very honest normal light will do, just remember to wear it. Highly recommended and Excellent purchase! Absolutely brilliant watch, beautiful stylish and professional. not the simpliest to set alarm but does so muc. Superb product, Looks great on, Clear large display even in the dark and with Eco drive no need to replace battery. Worth every penny. This watch is large, considerably weighty, and has a quality solid feel to it. if you have small wrists it may seem quite bulky. I find its size and weight appealing as I personally prefer large, sturdy watches. Despite being large it is very comfortable to wear and is suitable for practically any occasion. The web picture displays the watch as black, however, in reality it is more of a carbon / graphite colour, the bracelet being a combination of brushed and polished steel. The face contains a blend of graphite, chrome, white, and hints of blue which, when the light shines through the Sapphire Glass, is Absolutely Stunning! Functions include a Stop Watch and an Alarm which are useful to have. But, for me the highlights of this watch, other than its aesthetics and sheer presence on your wrist, is the fact that it is Eco-Drive (Solar Powered) and Atomic Time (Time and date is set automatically by a transmitted signal which is received daily by the watch). There is a power indicator and the watch enters sleep mode when it has not been exposed to light for 30 minutes or more, it then automatically resumes when light hits it – Very Impressive! In summary: The AT4007-54E is Utterly Striking to look at, is comfortable and suitable to wear for any occasion, powers itself by light, and sets the time and date automatically. If you like how it looks in the web picture you’ll absolutely love it in reality! This watch is AWESOME! I bought this before christmas and I have not been disappointed with it's look and quality. The weight is good and I can't stop looking at it when I am wearing it, on that point the colour is black in picture but it is more bronze than black but that only adds to the watches awesomeness. It is quite simply the watch I have always wanted. I would highly recommend this watch to you. Very aesthetically pleasing watch and is very stylish looking, i wear this watch to my office job and when out socialising and looks fantastic, it has a nice bit of weight to it but not too heavy at all. The flashes of blue in the buttons and on parts of the face really does boost the aesthetics of this watch. The text on the face of the watch is not too small or difficult to read, even the smaller text can be read with ease. A really good point to make is that as this watch is radio controlled if you accidentally pull the crown out a little bit for whatever reason the seconds hand will automatically turn to the 30seconds mark and when pressed back in the watch automatically adjusts itself to the correct time. Also very handy as it is run by light and never has to be sent away anywhere or handed in anywhere for a battery change, All in all very pleased with this watch and honestly cannot think of a single flaw about it. This Citizen watch in all black, including the bracelet, looks absolutely fantastic. It is Radio Controlled and I have had fun comparing the accuracy with GMT on the internet - completely spot on. Great watch. I can highly recommend it. Amazing service. Ordered on Wednesday arrived at 11am the next day. The watch itself is stunning, lighter in weight than expected, boxed nicely and overall just perfect gift.